Product prices and availability are accurate as of 2019-04-19 11:18:31 UTC and are subject to change. Any price and availability information displayed on http://www.amazon.com/ at the time of purchase will apply to the purchase of this product. ALEXANDER + DAVID: The Pursuit of Contemporary Essential Pieces. Ready-to-wear comfort, Timeless classics, elements of style. 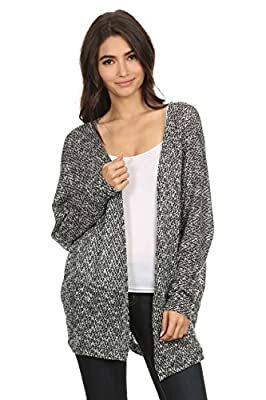 This open front cardigan gives a cozy chic look to an everyday look. The open front gives a drape effect which makes this look effortlessly put together. This pairs nicely with a simple tank or tee with a pair of leggings for those cooler days. DETAILS: Polyester/Rayon lightweight two tone blend knit fabric. 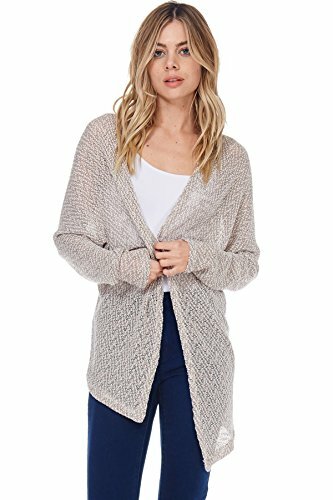 Open Face drape front knit mid length cardigan. FABRIC CONTENT: 57% Polyester. 43% Rayon. Made in USA. SIZE & FIT: Measurements taken from a size Small. Shoulder to Front Bottom Hem 29". Back Length 21.5". Sleeve Length 22.5". Model is wearing a size small. Model's Measurements --- (Grey/Black) Height 5'7". Bust 31". Waist 24". Hips 34". ---Model's Measurements --- (Mocha) Height 5'8". Bust 32". Waist 24". Hips 33.5". CARE INSTRUCTION: Hand wash with cold water. Do not bleach. Hang or line dry. SIZE DISCLAIMER: Check our size chart in the photo gallery, please buy with confidence. --- Color Disclaimer: Due to monitor settings and monitor definition of pixels, we cannot guarantee that the color you see on your screen is as an exact color of the product. We strive to make our colors as accurate as possible, but colors are approximations of actual colors.